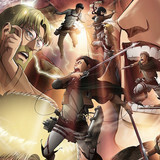 Learn which 90s TV show influenced some of the anime we all know and love! If you never saw it, or are maybe too young to remember it, Twin Peaks was a television show that, on the surface, seemed like many other shows: an FBI agent comes to investigate a murder in a small, close-knit town. What viewers soon discovered, however, is that Twin Peaks was anything but an ordinary town! 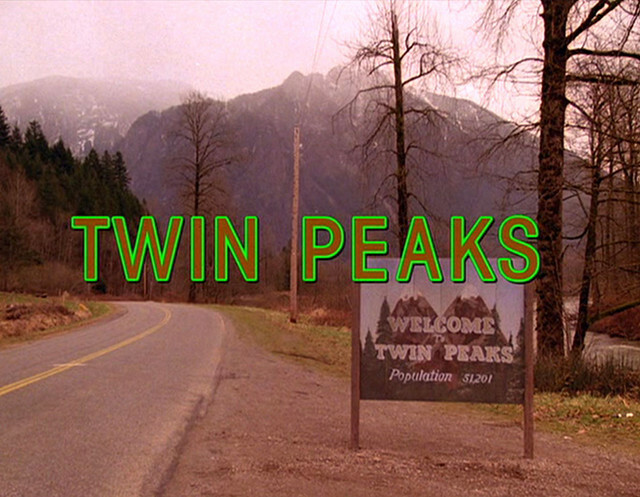 David Lynch, director of films such as Eraserhead, Blue Velvet and Mulholland Drive, exerted his similarly cryptic and unique style into the tv drama as Agent Cooper investigated the mysterious death of Laura Palmer. Twin Peaks was a success during its initial season, as the quirky characters and mixture of offbeat comedy and dread caught viewers by surprise; it truly was a unique show for the time! Although the second season didn’t receive quite the same level of popularity, the show became a cult favorite that had a huge impact on pop culture in general, leaving audiences with the similarly odd film Fire Walk With Me… until the show was revived after a 25 year hiatus in 2017! But while Twin Peaks was a hit with Americans, it was a massive sensation in Japan. While Fire Walk With Me was a commercial bomb in the US, it became a huge financial hit in Japan! Twin Peaks mania swept through the country, resulting in everything from unique, Japan-only coffee commercials featuring the main cast, fanzines and photo books of cast and characters, and even a board game made by Sega! Since the show aired, the influence of Twin Peaks has found its way into numerous video games, anime, and even fashion in Japan. In some cases, the references and homages are subtle and easy to miss if you aren’t already a Twin Peaks fan, while some are really overt! One that’s easy to miss is in Naoki Urasawa’s Monster! Monster features a character known as The Baby, a vicious neo-nazi who routinely dances in a closed off, curtained room, much like The Man From Nowhere in Twin Peaks. 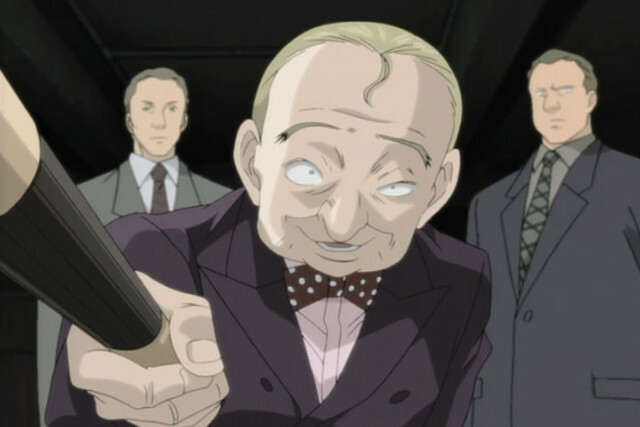 The Man From Nowhere is perhaps the most common Twin Peaks reference to pop up in anime series, as a similar character appears in Episode 12 of Soul Eater. 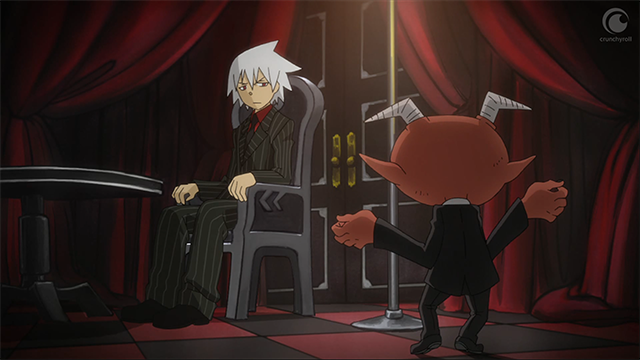 Soul recounts that he keeps having a weird dream where he ends up in a black and red room, and is confronted by a dancing devil wearing a suit. This dancing devil and his stark environment are a clear call back to the Red Room of the Black Lodge, and even features Maka dressed like Laura Palmer! And speaking of mysterious men in odd, closed off, colorful rooms, fans of the Persona series are probably well aware of Igor, master of the Velvet Room! In an interview, Persona designer Kazuma Kaneko gives a nod to David Lynch’s works for inspiring Igor and his secretive lair, stating: “I like how the Black Lodge was designed, so we put in our own version of it, only we made it a blue room rather than a red one. The blue, the “Velvet” motif, we’re definitely not subtle about liking David Lynch’s work. 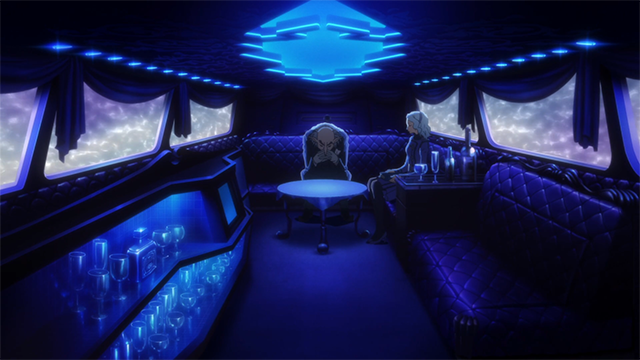 So to me personally the Velvet Room and Black Lodge serve similar purposes within their respective stories.” Although Igor’s domain has changed quite a bit from a room, to a car, to a jail, the intent and motifs are certainly still quite noticeable! But that’s not the only place that Persona and Twin Peaks cross paths. Although the games of the series have occasionally drawn from Lynch’s works in the past, there is probably no series more overt in the motifs and styles of Twin Peaks than Persona 4! Persona 4 has a lot in common with Twin Peaks: a stranger comes to town as a mysterious murder in a sleepy town causes people to buzz with gossip and fear, and strange, otherworldly events start to happen to the protagonist and their friends. 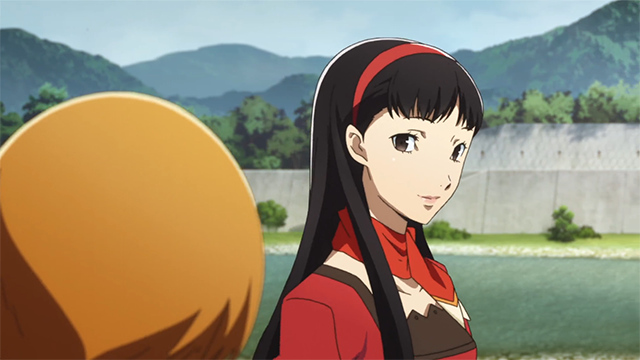 There are even more connections that astute fans might notice, from how certain characters act to the roles that they play in Persona 4’s story; without giving too much away, an easy example is comparing the characters of Yukiko and Audrey. They’re two women who feel trapped by their gilded cages: both deal with the anxieties of being expected to inherit their family’s inn and never leave town. Mysterious murders and paranormal or psychic episodes affecting small, sleepy towns may seem familiar if you’re aware of Satoshi Kon’s Paranoia Agent. Kon’s works in general seemed to owe heavily to influences from David Lynch, and that is probably nowhere as apparent as this psychological thriller following the enigmatic Shonen Bat and the detectives desperate to stop him. 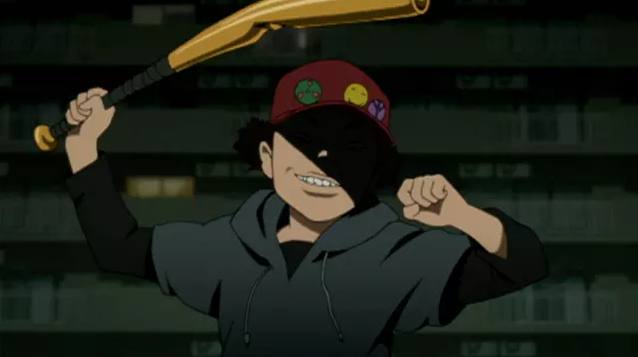 Much like Twin Peaks, Paranoia Agent’s twists are must watch, and you definitely won’t see them coming! 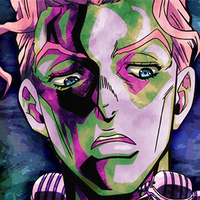 If you happened to think of another sleepy, isolated town in which strange murders started to happen and odd supernatural things accompanied them, then you might be right if you were thinking Morioh-cho from Diamond is Unbreakable! 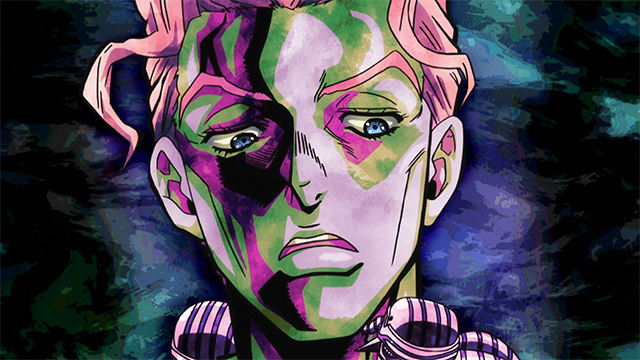 Much of the JoJo series to that point was about grand adventures in mysterious places and travels across the globe, but Diamond is Unbreakable takes the action down a notch to the small location of Morioh-cho. Not only do Josuke and co try to solve the mystery of a serial killer, the town also features ghosts, odd locations, and a vibrant and bizarre cast of local characters. Astute viewers might even pick up on some of the similarities between Twin Peaks and JoJo’s antagonist…! Twin Peaks certain far outlived its airing on television, with video games like Deadly Premonition and Mizzurna Falls paying direct homage, to numerous anime callbacks and influences. 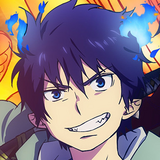 But the recent revival also stirred some buzz in Japan, with creators like Hideo Kojima tweeting about being excited to see the new series! 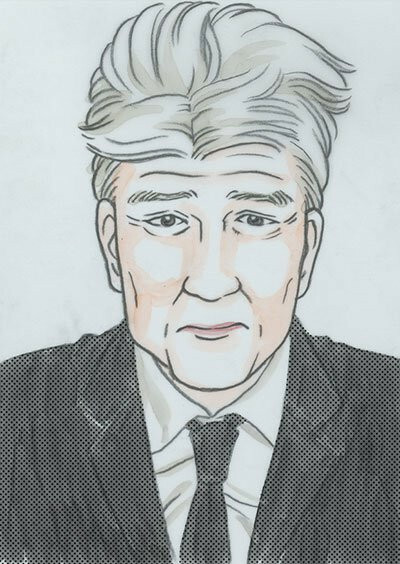 In honor of the show airing on the WowWow network, manga artist Hirochi Maki drew a stylized portrait of every character, starting with David Lynch’s character Gordon! 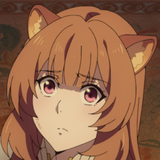 It seems that Twin Peaks will likely remain a major influencer on media for years to come, especially with the renewed interest and resurgence in popularity from the 2017 revival, meaning now is a great time to acquaint yourself with the quirky show, and then see if it pops up in any of your favorite anime! Remember, as Agent Cooper said, “Every day, once a day, give yourself a present”, and what better present than binge watching your favorite shows for new secrets? 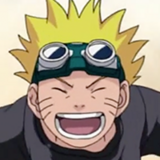 Do you know of any other Twin Peaks connections in anime? Let us know in the comments!